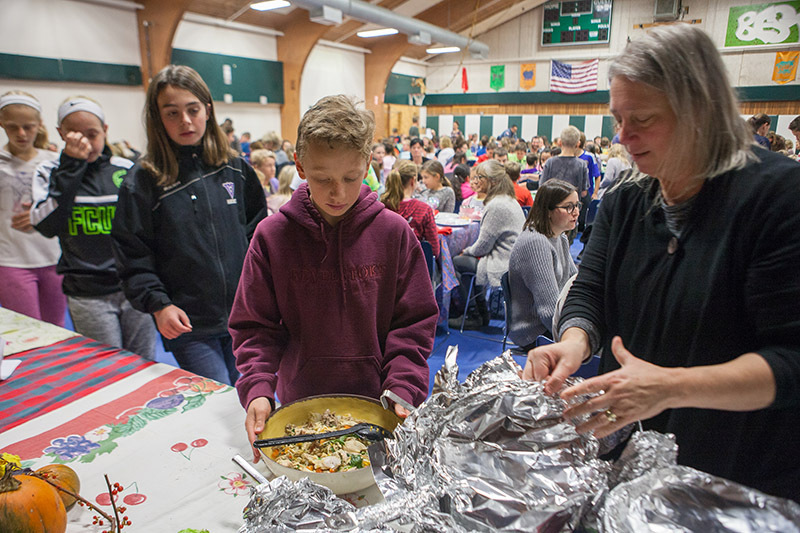 Modeled off the Chilmark School’s quarterly community lunch program, “up-Island lunch lady” Jenny Devivo launched a West Tisbury School community lunch, which fed more than 400 students, teachers, and special guests in the school’s gym last Thursday. 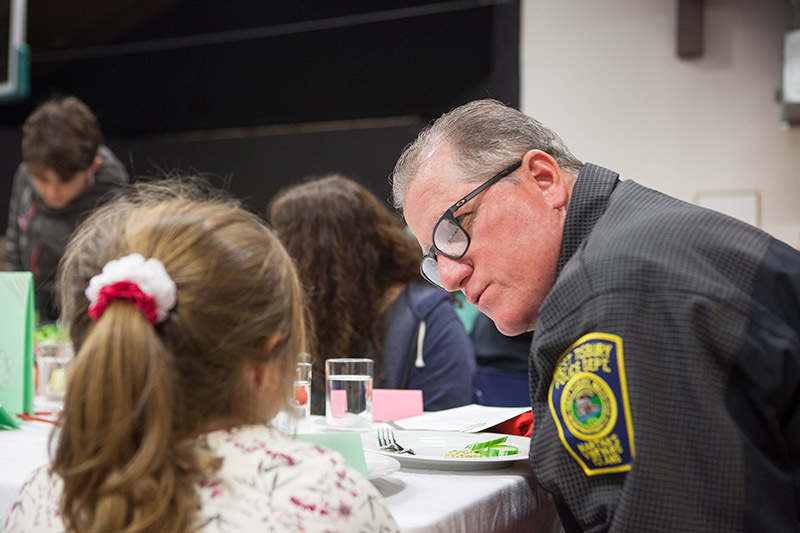 The guest list included Schools Superintendent Matt D’Andrea, West Tisbury Police Chief Daniel Rossi, West Tisbury Police Officer Bradley Cortez, and chairman of the school committee Robert Lionette, among many others. 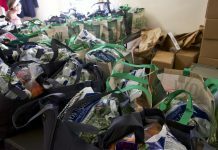 Several farmers, fishermen, and teachers were also scattered among the tables. Each table had one student from first through eighth grade, one teacher, and a special guest from outside the school. 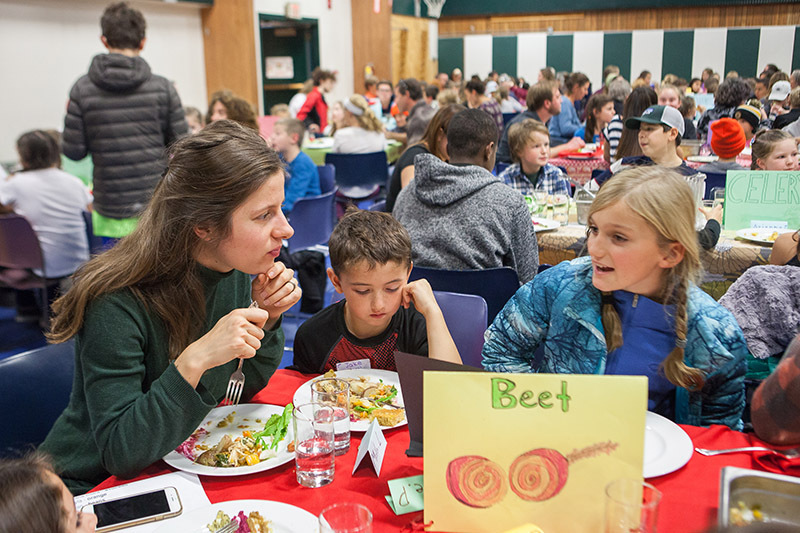 The motivating idea behind the event was for students to dine with schoolmates they don’t normally see, learn proper table manners, and share good food with community members. 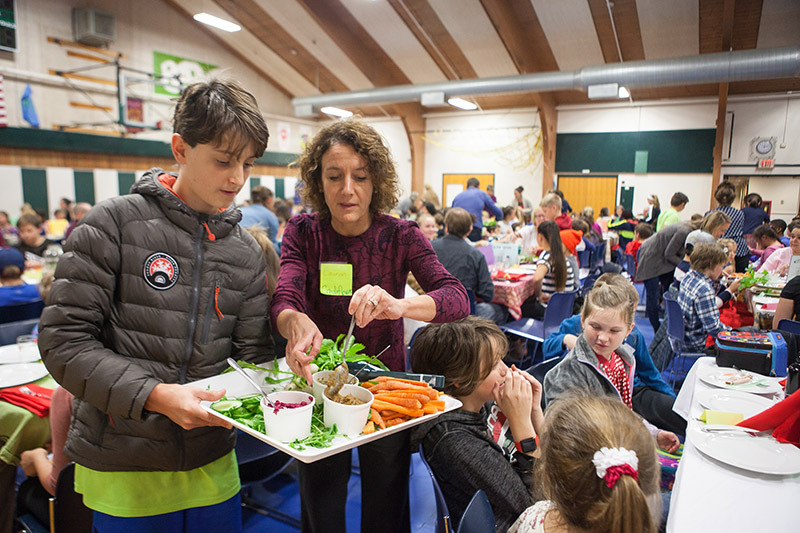 It’s hoped the lunch is the first of many, said Ms. Devivo and West Tisbury School Principal Donna Lowell-Bettencourt, in conjunction with Katie Ruppel of Island Grown Schools. 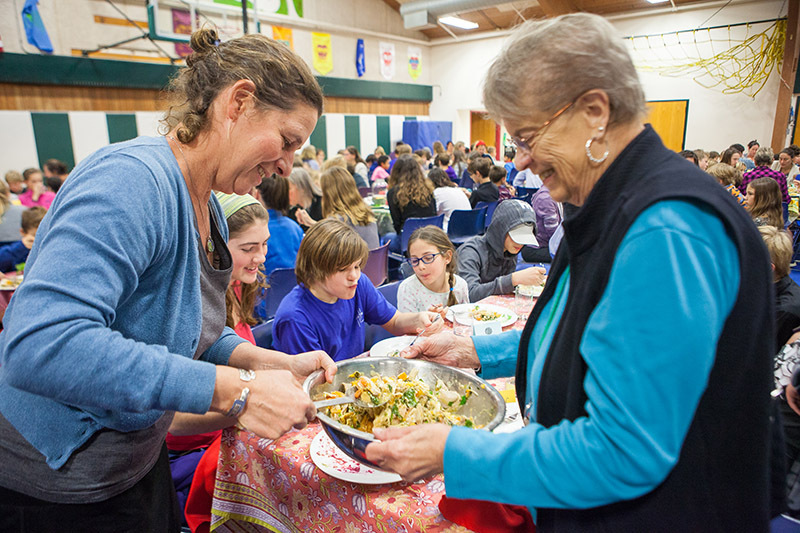 They are hoping to host a seasonal lunch with the whole school at least four times a year, inviting a different group of community members each time. Conversation buzzed in the air as the guests chowed down. Thursday’s menu featured veggie crudités with Morning Glory Farm carrots, cucumbers, celery, and baby turnips with a roasted beet hummus, sautéed kale hummus, and baba ghanouj, a roasted eggplant dip. The main course was chicken stew, with GOOD Farm chicken and Beetlebung Farm spinach served with cornbread. For dessert, there was a crunchy chocolate bark, topped with granola. Icebreakers were given to each table, which included a sheet of questions and jokes. Students took turns answering questions like, What do you want to be when you grow up? 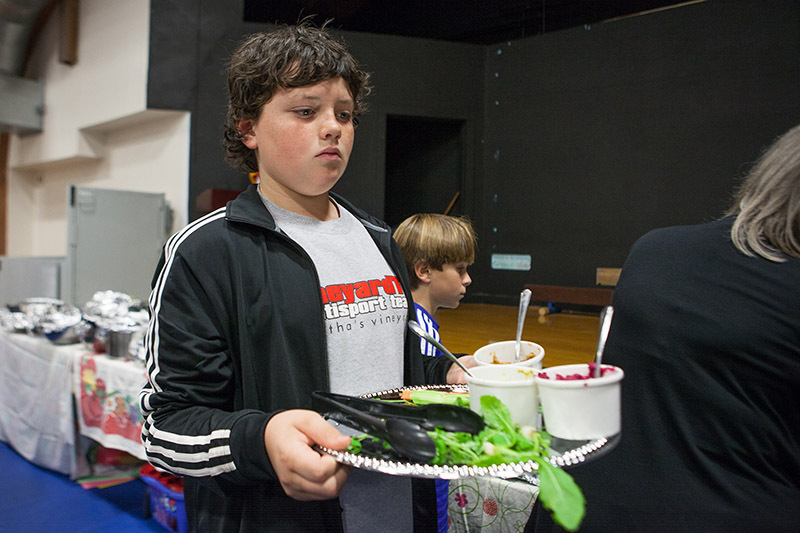 The sixth grade students were tasked with an extra responsibility, as they set up the dining room and were responsible for serving and and clearing plates during the meal. 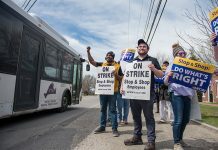 “This is the best thing that happened all year,” West Tisbury guidance counselor Graham Houghton said to Ms. Devivo as he made his way to his table. 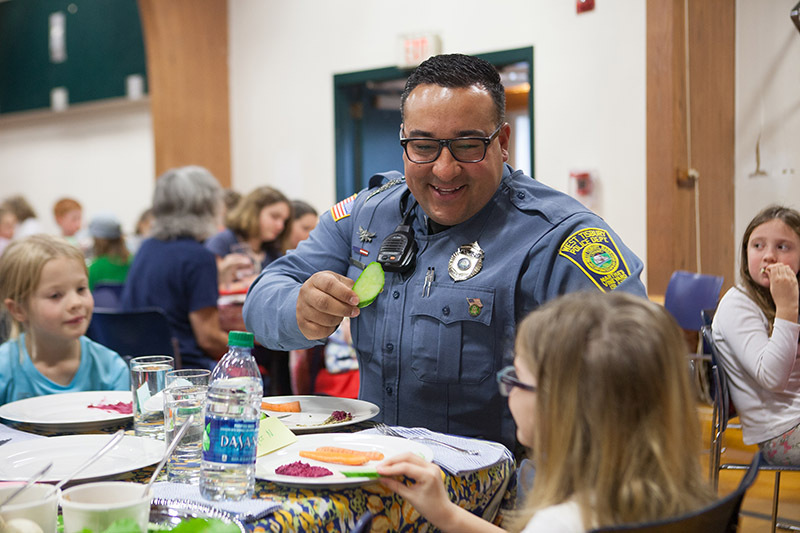 “The best chicken stew I’ve ever had,” Chief Rossi said after the meal. Many students echoed that sentiment, buoyed by the energy of their peers and the chance to enjoy an extended lunch hour. “We’re so scheduled, there’s so many things going on throughout the school day, that there’s very little time to do schoolwide assemblies,” Ms. Devivo said. “This was the perfect way to start, to break bread and bring people together. So it made people’s brains expand. We can do a movie night or a talent show.